With plenty going on downstairs at Far East Plaza—the winding lines for Howlin' Ray's, the new Easy's Burgers—there's now a welcome addition upstairs as well. 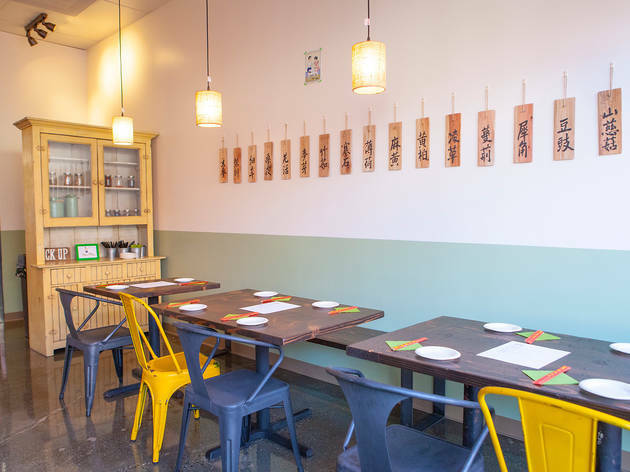 Lao Tao Taiwanese Street Food opens on Wednesday, September 14, a concept helmed by chef David Wang, who has been workshopping his new restaurant at Chinatown After Dark and night markets around LA. 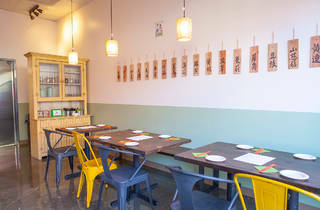 The restaurant is small with only 25 seats, and decorated with retro, grade school posters and wooden planks depicting the Chinese characters for various spices. Though Wang is from China, he grew up primarily with Taiwanese classmates, who instilled in him a love for Taiwan's rich and varied street food. At Lao Tao (which means food monster or, roughly, "foodie") you'll find Taiwan's national dish, Beef Ban Mian: flat noodles coated in an eight-hour marrow sauce and topped with five-spice beef shank, Taiwanese napa cabbages, pickled veggies and green scallions. The Sea Land Tofu Skin Roll is perfect for sharing in a group; it features six slices of a tofu roll stuffed with pork and fish paste, the filling also includes minced vegetables and water chestnuts, plus HaiShan sauce on the side. Another great shareable dish: the Oh Ah Jian, a baby oyster pancake with egg, Asian basil, Chinese leek, Taiwanese napa cabbage and HaiShan sauce. Two of Wang's best dishes are the Chao Shou—pork filled wontons—and Century Egg Tofu Salad. The wontons are bursting with perfectly spiced pork rolled in hot chili oil, then topped with homemade Hong You sauce, peanut powder and green scallions. The tofu salad could hardly be considered a salad—instead, silky tofu cubes are accented by that same Hong You sauce, and surrounded by rousong (a pork floss that has the texture of cotton candy) and century eggs, a blackened delicacy that looks far more intimidating than it tastes (and it tastes incredible). Throughout each dish, we marveled at how expertly Wang employs heat—each dish left our mouths tingling a little without feeling like our tastebuds had been scorched (we'll go to Howlin' Ray's downstairs for that, thanks). To drink, there are a couple refreshing beverages on the menu: ginger lemonade with chia seeds and a sweet, iced Osmanthus Oolong tea. Check out our photos from Lao Tao's preview dinner! Lao Tao will soft open on September 14-18, 11am-3pm. The grand opening is on September 21, with hours from 11am-3pm and 5-9pm. Closed on Mondays.